The Colorado Buffaloes (11-7, 2-4 Pac-12) visited the University of California Golden Bears (5-14, 0-7 Pac 12) in a Pac-12 matchup as they won 68-59. Each team looked a little sluggish getting into their sets. All of a sudden, Colorado began to make shots and took advantage of California’s defense and jumped out to an early lead. With about 10 minutes remaining in the first half, Colorado began to pick up some steam. Their offensive attack was spearheaded by Junior guard Shane Gaitling. Gaitling scored 11 first half points on 3-of-8 shooting from the three-point line. The entire Buffaloes team would do a great job of making cuts and finding the holes in the Bears defense. Both teams are not known to be defensive stalwarts. The Bears came into the game ranked 351st out of 352 teams in nation on defense. This would be evident by allowing the Buffalo to score 34 first half points. This was done on 48 percent shooting from the field. Junior guard Paris Austin for the Bears is a true floor general and leader. Austin made sure his teammates are in the right spot, called for picks and instructed them on defense. Where Austin really shined in the first half was knocking down a 17-foot jumper and then a layup as time expired before the half. Immediately running off the court, into the locker room to prepare for the second half of the game as California trailed Colorado, 34-23. 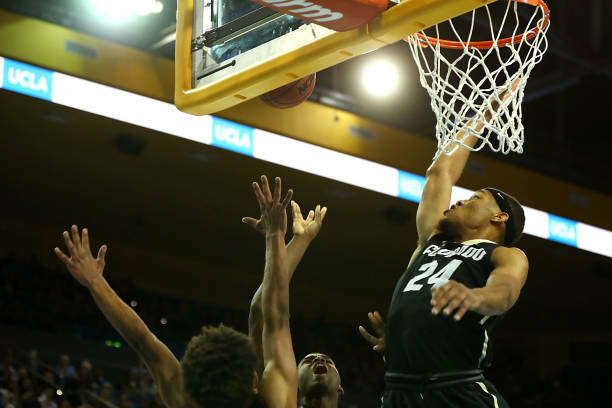 As the second half started, Colorado was very aggressive on the offensive end as it made quick cuts to the rim and again sliced through the Cal defense. At the 16-minute mark, Cal offensive picked up all of sudden. Sophomore guard Darius McNeil was the catalyst scoring nine points in a three-minute stretch. At 13:24, McNeil made another three-pointer which erupted the crowd, which cut the Colorado lead down to nine. “I thought we did a really good job of fighting back. I felt we grew this game,” Austin said. Austin would cause two turnovers on defense, which helped the Bears get the lead down to two points about half way through the second half. Freshman guard Matt Bradley in this same period created two more turnovers and made a pair of free throws. This gave the Bears their first lead of the night. The Bears kept fighting to win the game, but Colorado would not let them. Sophomore McKinley Wright of Colorado would but the final dagger into the Bears. Shooting and making a long range three-pointers to put the Buffaloes up six with 29 seconds remaining. Junior forward Lucas Siewart led all scorers with a game high 18 points.